Do you know what a devil’s advocate is? If you don’t, here it is: One who argues against a cause or position, not as a committed opponent but simply for the sake of argument or to determine the validity of the cause or position. That’s what I think Harper Lee’s “Go Set a Watchman” was, a devil’s advocate written to add some reality to the complexity of racism in the United States that has become too much of a black and white issue when in reality there are many shades of color at work. When the sequel of “To Kill A Mockingbird” came out, the first thing I read was one or more of the politically correct mobs lashing out when they condemned the book because of an early scene in the novel that depicts Atticus Finch as a racist, but I didn’t let that stop me from buying an audio version of the book on six CDs at Costco, and I’m glad I did because the story in this novel offers a brutal reminder that hot-button issues like abortion, school reform and racism can’t be dealt with in a 14-second politically correct sound bite by one side or the other. Reality is more complex then simple and often ignorant thinking. After listening to the novel, Atticus Finch turns out to be a complex individual and I don’t think he was the kind of racist that fits the stereotype that so many love to hate. He didn’t belong to the KKK. He was not a white supremacist. In fact, Atticus didn’t even own one of those white cloaks with hoods that have holes cut out for the eyes and mouth. Instead, before the end of the novel, we learn that Atticus might believe in separate but equal, but he would also be the first one to put his body between a fire-breathing racist lynch mob and an African American the mob wants to hang from the nearest tree, because it’s obvious Atticus still believes in justice and equality for every person but maybe not everyone’s definition of what that means. Right or wrong, I don’t think Atticus deserves to be condemned. Reserve that anger for those who bomb black churches, murder minorities for just having a different shade of skin and/or block the right of minorities to vote. I taught “To Kill a Mockingbird” in high school, and I’ve seen the film a number of times, so I was ready to read about the characters who were 20+ years older, and I was not disappointed. The audio book is read by Reese Witherspoon, and Jean Louise Finch—Scout—reminds us that she was a child once when she takes readers on journeys back in time to when she was a child and then an adolescent becoming a young woman. I think Witherspoon’s voice is exactly what we would want Scout to sound like as a young woman in her twenties. Instead of jumping blindly on the politically correct bandwagon that defines what racism is, read this book and do what it was designed for: weigh all the factors and think for yourself. Then judge individuals like Atticus on an individual basis and not a blanket indictment written by an often angry and mindless mob. Lofthouse’s first novel was the award winning historical fiction My Splendid Concubine [3rd edition]. 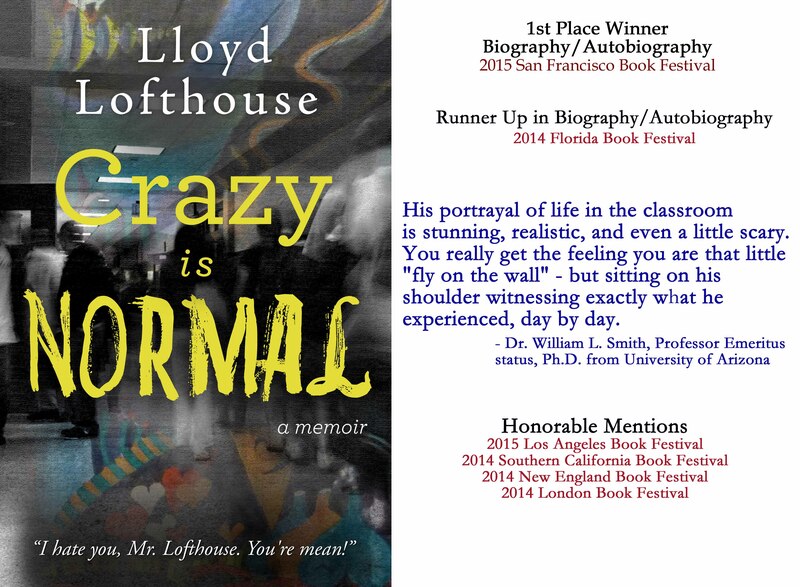 His second novel was the award winning thriller Running with the Enemy followed by his award winning memoir Crazy is Normal . His short story A Night at the “Well of Purity” was named a finalist of the 2007 Chicago Literary Awards. ← Is David Coleman a psychopath, and what does that mean for the rest of us if it’s true? I can’t help wondering if Harper Lee also intended Go Set a Watchman as a response to the popular canonization of both novel and character. It’s possible, but I think Lee wrote this book first and when it didn’t fly, she wrote “To Kill a Mockingbird” because she correctly judged that it’s plot would be politically correct and acceptable for the thinking that was starting to sweep across most of the country at the time. my impression from following the (admittedly muddled) story of publishing history is first draft but revised/re-written making both scenarios equally likely and ultimately unknowable — unless a personal journal with an entry turns up somewhere along the way supporting one or the other. I find that history written fifty years or more after the event tends to more more accurate than what we read in the media when the events are happening. Sometimes we have to wait a century or more to get a closer look at what was really going on back then. For instance, a book that I read recently called “The China Mirage” about the U.S. China Lobby (a fundamentalist Christian lobby group that firmly thinks the Chinese all want to become Christians even though only 2 – 4% of that country are Christians today) revealed that the militarization of Japan was urged by President Teddy Roosevelt and he even PRESSURED Japan to invade Korea, and they did eventually leading to war in the Pacific when World War II could have been in Europe fighting only the Nazis. And what’s really interesting is that most of these books that offer buried reputable and valid evidence that reveals what was really going on are not written by trained journalists but by scholars and historians who dig deep for the facts. Peter Novick (University of Chicago historian and scholar) would probably disagree with you on that point. I did a number of graduate history seminars in PhD program at UC Davis, including one for the historiography requirement. I stand by my initial assessment of no way to know. Call it a difference of opinion and close the thread. I’ve never closed a thread. Eventually they just fizzle on their own. That piece about the Devil’s Advocate was interesting. On a similar but different note: I think you already know that the Catholic Church has officially approved exorcisms and trains priests in how to conduct an exorcism to drive a demon out of a human’s body. In fact, there are about 50 Catholic priests in the Union States who were trained by the Vatican and several work out of the diocese of San Jose. Maybe we could ask the exorcists to drive the demons out of Michelle Rhee, Bill Gates, the Waltons, the Koch brothers, Eli Broad, Arne Duncan, and several state governors. Oh, and we should not forget the Hedge Fund managers who need to get rid of their RheeForm demons too. “…read this book and do what it was designed for: weigh all the factors and think for yourself.” Great advice and review! I had pre ordered the book but haven’t had a chance to read it yet. I rarely listen to audiobooks anymore because I don’t have to commute to work but I think Reese Witherspoon would make a perfect sounding scout! It is possible that listening to the audio book offered me a different experience than reading the book with my eyes. Then there is the fact that the book didn’t come with a formula genre plot that includes politically correct themes that seems so popular today with most readers. For instance, every Sunday, I check to see what films topped out at the box office and I have noticed that films offering political correct fantasies are making huge amounts of money but most films that are honest and depict life as it is are fortunate to break even most of the time. While a cartoon rakes in several hundred million dollars, a film like “Belle” (a film released May 2, 2014 about the end of slavery in Britain) only earned $10.7 million worldwide compared to the cartoon Minions that was released July 10, 2015 and has already earned more than $859 million. I’ve seen “Belle”, a film I HIGHLY recommend, but haven’t seen “Minions” and don’t plan to see it. What is that old saying? “garbage in; garage out”, and I think that might help explain why voters have allowed a totally dysfunctional elected government to exist in the U.S. today. Too many voters only pay attention to what the many corrupt oligarchs and elected reps say and not what they do. Oh, I want to mention that I’m almost done with the 80k+ rough draft for the first book in the 5-part series of “The Last Sorcerer” (SF/Fantasy). My goal is to finish the first three 80k+ rough drafts for books 1 to 3 before I publish the first one. I’ve been reading advice that says if you have a traditional length novel, break it up into three part of about 27,000 words each and publish it is a series becasue shorter is the new long. Here’s what I’m thinking—break up book one in The Last Sorcerer series, publish all three at the same time and also offer all three as one volume. That way, when the 5-part series is finished and all published, there will be a series of 15 shorter books selling at .99 cents each and five that combine the 15 in traditional length novels that sell for $3.99 each.